Importers will strongly feel the pinch of falling rupee as they will be forced to pay more rupees on importing products. Conversely, a feeble rupee will bring delight to the exporters as goods exported abroad will fetch dollars which in return will translate into more rupees. Also, a weak rupee will make Indian produce more competitive in global markets which will be fruitful for India’s exports. Buying imported stuff will become a very costly affair. You will have to shell out extra on imported goods. For instance if you bought a product valued USD 1, you paid around Rs 54 (weeks ago) but you will now have to shell out close to Rs 63 for the same product. A weak rupee will increase the burden of Oil Marketing Companies (OMCs) and this will surely be passed on to the consumers as the companies are allowed to do so following deregulation of petrol and partial deregulation of diesel. If the OMCs increase fuel prices, there will be a substantial increase in overall cost of transportation which will stoke up inflation. If the depreciation in rupee continues, it will further increase inflation. In such a situation RBI will have very less room to cut policy rates. No cut in policy rate will add to the borrower’s woes who are eagerly waiting to get rid of the high loan regime. 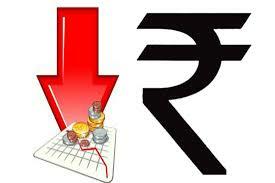 Students who are studying abroad will bear the brunt most owing to depreciating rupee. Expenses incurred towards the university/college fee as well as that of living will shoot up, thereby spelling a huge burden on the students. Tourism: The depreciating rupee will surely be a dampener if you are planning your holiday abroad. Your travel charges as well as hotel charges will escalate drastically, let alone shopping and other miscellaneous spending activity. Overseas Indians: Money saved is money earned. Depreciation of rupee is certainly a good news for the overseas Indians. Those working abroad can gain more on remitting money to their homeland. Country’s fiscal health: A frail rupee will add fuel to the rising import bill of the country and thereby increasing its current account deficit (CAD). A widening CAD is bound to pose a threat to the growth of overall economy.